VATICAN CITY The Catholic Church has awoken with no pontiff following Benedict XVI's resignation, in which he pledged obedience to his successor and described himself as "simply a pilgrim" starting the final part of his life. Now begins a period known as the "sede vacante" or "vacant see"  the transition between the end of one papacy and the election of a new pope. During these few days  no more than 20  a few key players take charge running the Holy See, guiding the College of Cardinals in their deliberations and organizing the conclave to elect Benedict's successor. In one of his first official acts as dean, Cardinal Angelo Sodano on Friday officially summoned cardinals to Rome to participate in the conclave, a formality given that most are already here. Sodano sent official "convocation letters" to the cardinals' offices around the world Friday, along with electronic versions via email, summoning them to the Vatican. And in one of his first official acts as camerlengo, or the chamberlain who actually runs the Holy See in the transition, Cardinal Tarcisio Bertone sealed Benedict's apartment in the Apostolic Palace on Thursday night. It will not be reopened until a new pope is elected. With the 8 p.m. Thursday end of Benedict's papacy, every department head in the Vatican lost his job  except for those whose offices are crucial for the smooth running of the transition period itself. 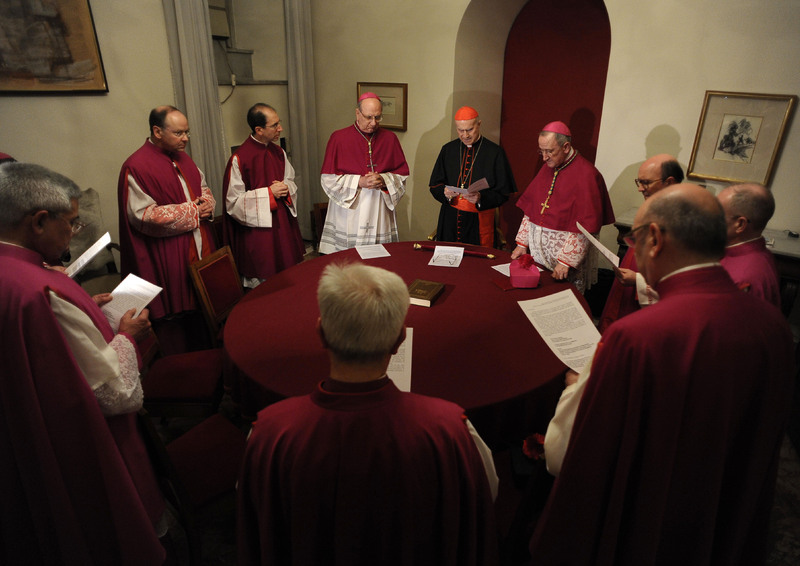 The date for the conclave of cardinals to begin their deliberations has not yet been set, although one of Pope Benedict XVI's final acts before resigning his office was to amend the rules governing the election of a successor, allowing the cardinals to meet earlier than the usual 15-day transition between pontificates. "What we talk about ... will be certainly the governance of the church and in that context there may be questions to people who did the report," said Chicago Cardinal Francis George. "I think we will find out a lot from a lot of sources to figure out what is necessary now to govern the church well here in Rome itself."